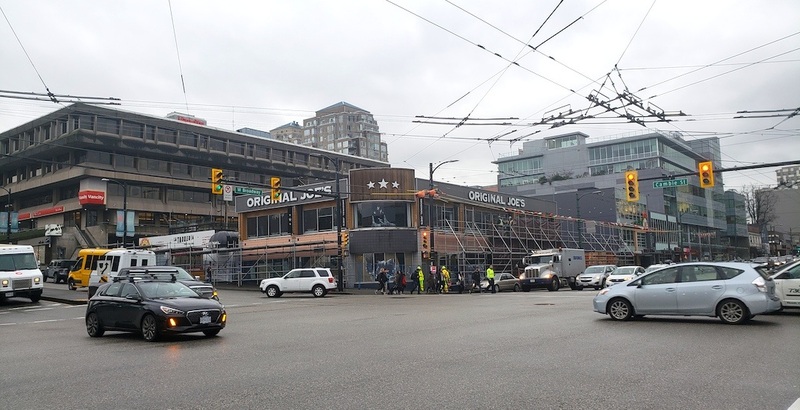 For months, the retail and restaurant spaces at the highly prominent southwest corner of the intersection of Cambie Street and West Broadway have been vacant in preparation for the site’s redevelopment. And now, demolition of the commercial buildings on the property have finally begun. An excavator demolished the site’s westernmost building on Wednesday, and the remaining two buildings on the site are expected to follow very soon. 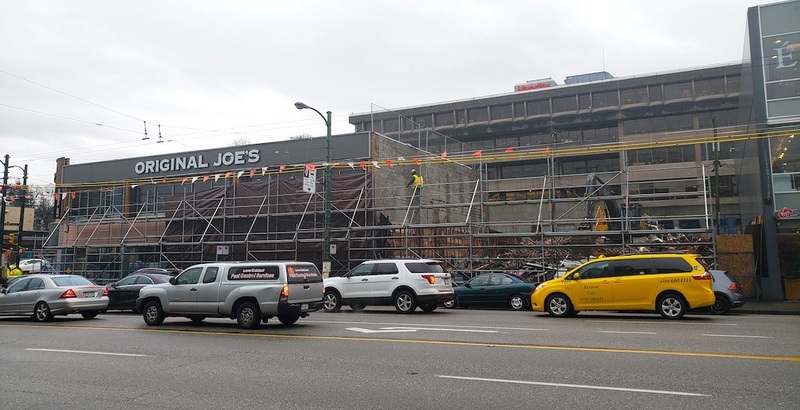 The buildings previously housed businesses such as Original Joe’s, La Taqueria, Starbucks, and a number of small businesses and independent restaurants. 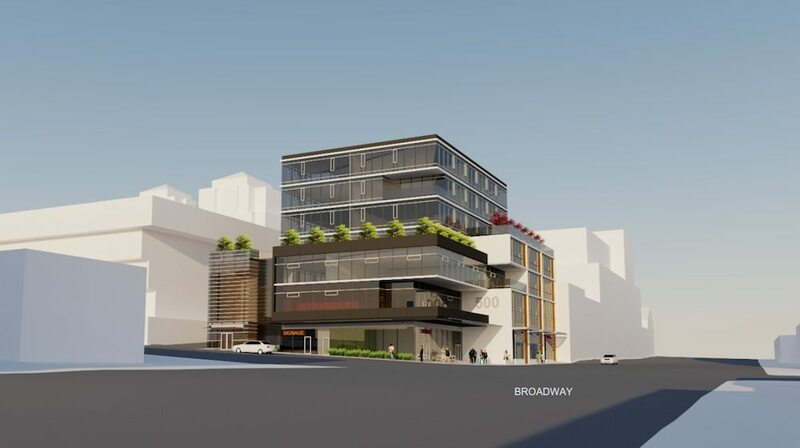 In 2017, prior to the launch of the Broadway Corridor Plan process, the municipal government approved Pacific Crown Management Company’s development application to redevelop the property at 510 West Broadway — just across from the Canada Line’s Broadway-City Hall Station — into a new seven-storey commercial building. 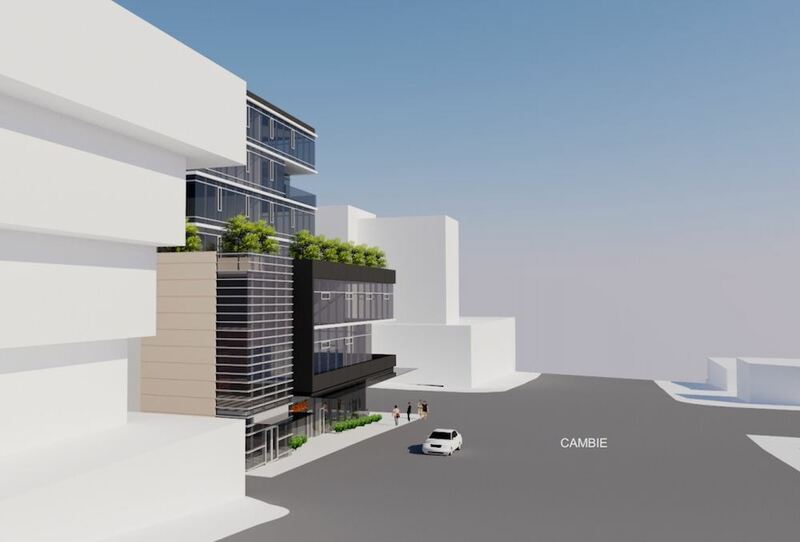 There will be retail on the first floor, a financial institution in office spaces on the first and second floor, restaurant space on the second floor, and more offices on third to seventh floor. 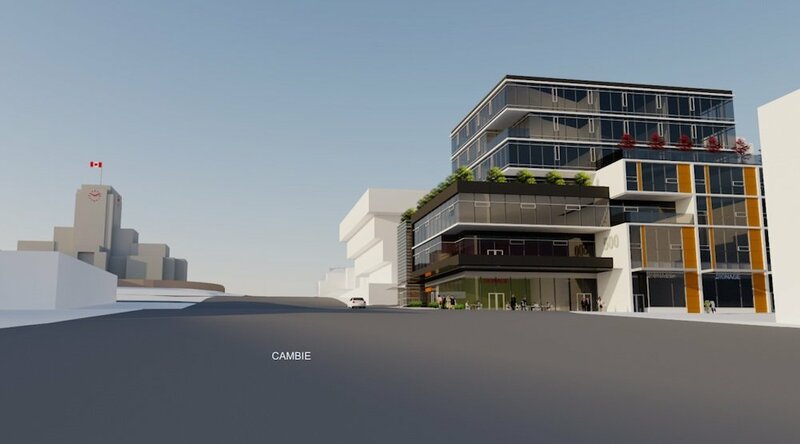 Two levels of underground parking with vehicle access from the laneway will support the building’s businesses. Given the site’s adjacency to the Canada Line and the future Millennium Line Broadway Extension station, which will turn the area into one of the region’s busiest hub, the site warrants significantly more density. However, there will be a total floor area of only about 61,400 sq. ft. and a maximum building height of 93 ft due to limitations on the site’s height to protect views from Vancouver City Hall and Queen Elizabeth Park. Tenants have not been publicly announced for the new building.